Production lead time for this product is 5 days. This product has a minimum order quantity of 4. 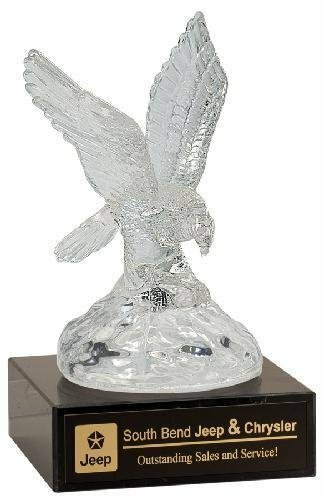 Sculpted from beautiful premier glass in amazing detail, this majestic eagle has a 5 1/2" wing span and sits on a 2 3/4" square solid black marble base. There is plenty of room to personalize the base to make this the ultimate recognition of excellence. 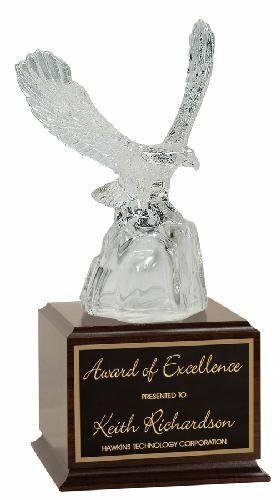 Sculpted from beautiful premier glass in amazing detail, this majestic eagle has a 7 1/4" wing span and sits on a 6-1/2" square cherry finish base. There is plenty of room to personalize the base to make this the ultimate recognition of excellence. This futuristic gold metal art design is topped with a shining star and mounted on a solid black crystal pedestal base. 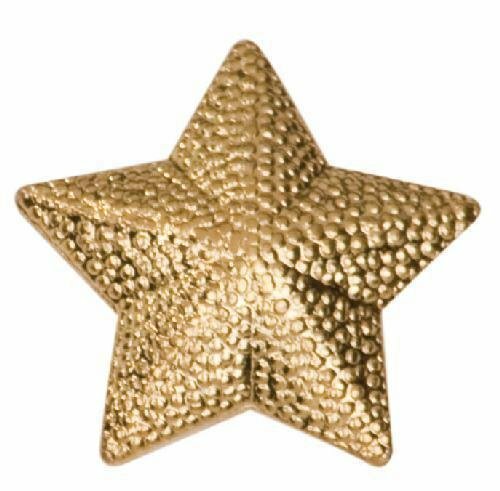 Personalize the base to honor the forward thinking shining stars in your organization. Production lead time for this product is 5 days. This product has a minimum order quantity of 25. A shining gold constellation of 3 stars sits atop an elegant rosewood piano finish cup base with an overall height of 9-1/4". 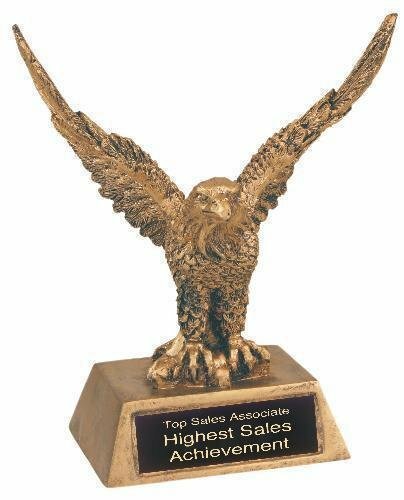 The base has ample room for personalizing a recognition of excellence for the shining stars in your organization. 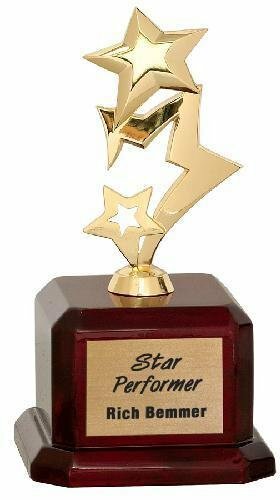 The Green Marble Shooting Star Acrylic Plaque Award is perfect for any employee recognition award, achievement award or sales award presentation. 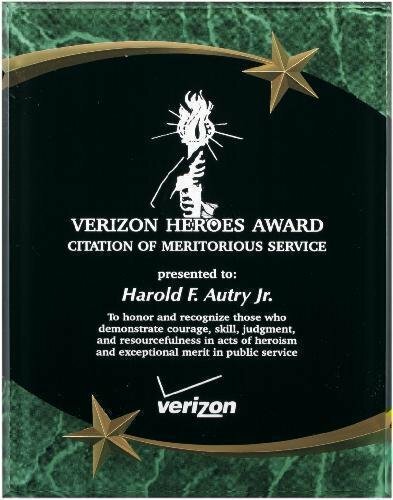 Available in multiple sizes with a marble colored accent which enriches the elegance of this acrylic award plaque. This beautifully hand painted eagle sits on an elegant rosewood piano finish base. 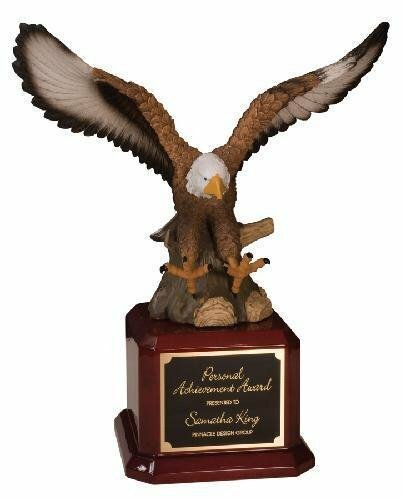 The base has ample room for personalizing, and with an overall size of nearly 14", it makes a majestic executive award or recognition of excellence for military personnel. 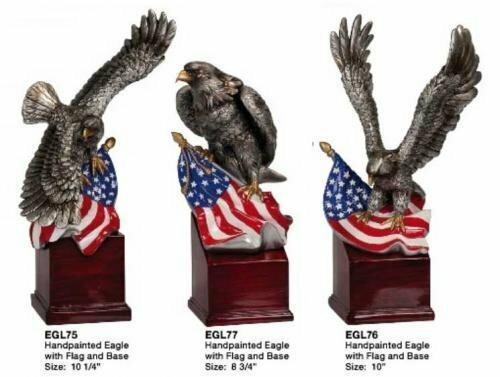 These beautifully hand painted eagles with Amercian flag sit on an elegant rosewood base. 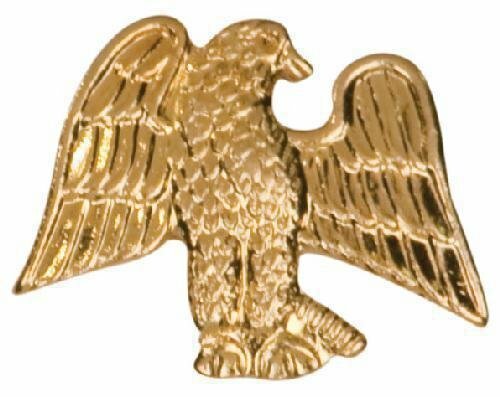 The base has ample room for personalizing and makes a majestic executive award or recognition of excellence for military personnel.